Next Article How sustainable is your menu? In 2013, Albert Adrià was considered one of the most underrated chefs in the world. As the visionary behind elBulli, once considered the world’s greatest restaurant, his older brother, Ferran Adrià, cast a long shadow. 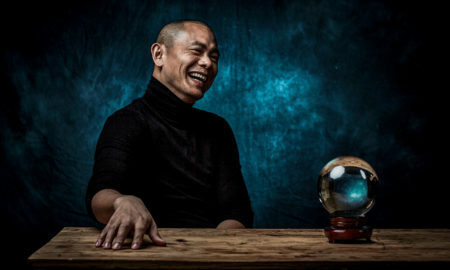 How – Albert is giving their last name his own meaning, and – why he opened five restaurants in a single year to do it. 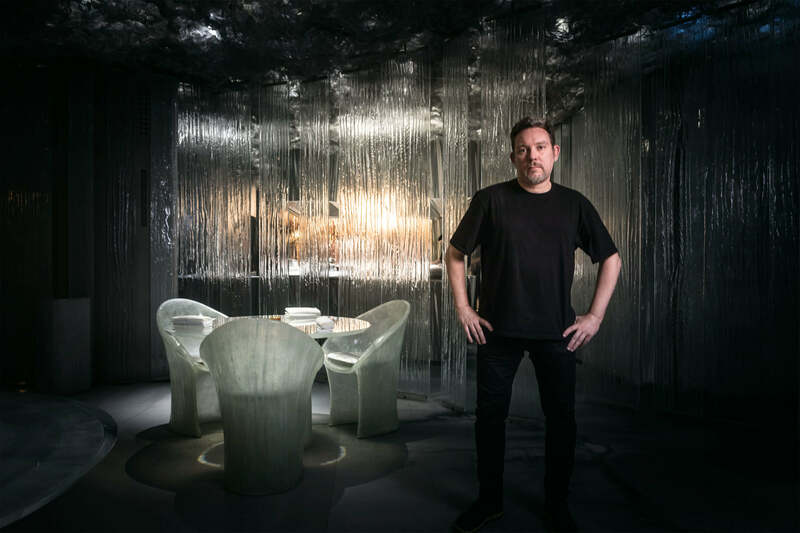 “The king is dead, long live the king,” says Albert Adrià in 2013 when he closes 41°, his restaurant in Barcelona — a culinary playground where sixteen customers can explore new gastronomic horizons in true Adrià style. The restaurant next door, Tickets, is still going strong, celebrating La Vida Tapa — but not, of course, without breaking every step of the process down and switching things up wherever possible. Nobody wants the place to be seen as lacking imagination, after all. For Albert Adrià, 2013 is all about pooling energies in new ways. He’s got big plans for Avenida Parallel, where Tickets is located, and for the streets around it. It marks the five-year anniversary of Albert’s departure from elBulli in order to spend time with his newborn son, Alex, and to publish Natura, a masterpiece of a pâtisserie book. In 2011, Albert Adrià opened Tickets in Barcelona, marking his return to the culinary spotlight. He had big plans for the new restaurant. “I was scared as hell when we opened,” the now-48-year-old Catalonian remembers. “People were expecting another elBulli in Barcelona.” That was never the plan, of course. Putting the name Adrià on an entire district of Barcelona wasn’t the plan, either, but that’s exactly what happened. (BarriAdrià, it’s called.) Big brother Ferran Adrià is convinced that all great chefs are driven to create new things, to forge new paths, without worrying about how many Michelin stars they have or how large their gastronomic empire is. 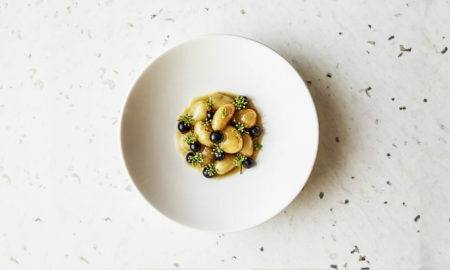 By the time of Enigma’s much-delayed opening in January of 2017, the tapas at Tickets had already received its first Michelin star, followed by a star for Pakta’s Nikkei cuisine, and then one for Hoja Santa — whose Mexican fare had been deemed Michelin-star-worthy only a year after the restaurant first opened its doors. “Clearly, Paco wants more,” Albert Adrià says of Hoja Santa’s head chef. 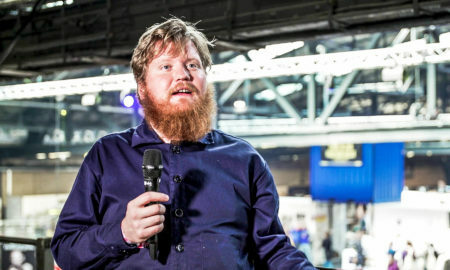 He had, after all, packed up his worldly belongings and moved from Mexico to Barcelona to help Albert Adrià’s restaurant develop the right reputation — namely, one as a truly inspired kitchen combining fantastic products with centuries-old traditions whose perfection you had to taste to appreciate. Customers at Pakta come away feeling no different. 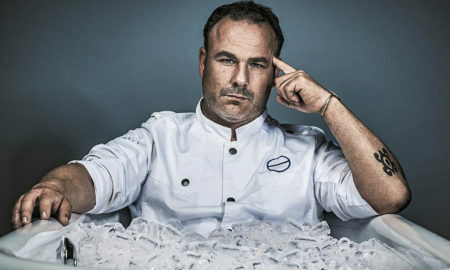 Jorge Muñoz and Zetkin Lian Chung are at the wheel there, and have been at Albert Adrià’s side since the beginning. 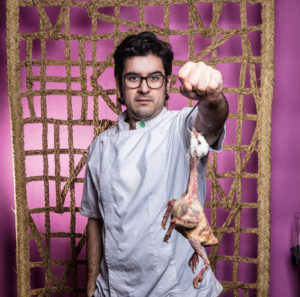 “Nikkei,” Adrià says, “is the cuisine that developed as a result of Japanese immigration to Peru.” The word roughly translates as “at home away from home,” and Nikkei cuisine now has another home away from its own home, at Pakta in Barcelona… about a quarter-mile from Tickets. Amid colorful weaving looms and upholstery, warm-toned wood and decorative corn cobs, diners at Pakta enjoy “sea cucumber nigiri with ume shoyu and shiso” or “bouchon mussel tiradito with codium and smoked coconut”— some dishes delivered from the kitchen, at others from the open sushi bar near the front of the restaurant. 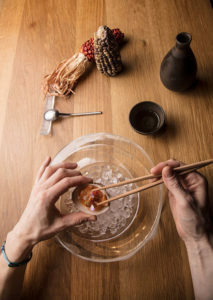 Customers are right in the center of it all, in the middle of a perfectly choreographed dining experience that is at once quintessentially Adrià and yet authentically Nikkei, complete with sake and chopsticks. Patka and its cohorts offer both fun and inspiration. As Adrià says, “Each restaurant has its own individual language – is a genre unto itself. Like a movie. Except they all have the same director.” Makes sense. Especially considering that Albert Adrià says that, if he hadn’t decided to become a chef, he’d likely have gone into filmmaking. Now his culinary creations are ready for their closeups, and everyone’s invited to visit them on set. You just have to decide what you’re hungry for. In the mood to experience a turn-of-the-century Barcelona pub? Ferran Soler at Bodega 1900 is the person to visit. The pub returns vermouth to the “hip” status it enjoyed around a hundred years ago. Spain’s traditional “vermouth hour” is alive and well here, celebrated using ice cubes that reveal a “1900” when they come in contact with the drink. Drinks are served with olive spheres (what would Adrià be without elBulli’s famous liquid olives? ), anchovies, and cockles. The many Polaroids of cheerful Bodega 1900 visitors, smiling down from the pub’s old wooden beams, are proof enough that the combination is a winner. Look closely and you might catch a glimpse of our editor, Jürgen Pichler, and the rest of the ROLLING PIN crew among them. Cross the street and you’ll find yourself at Tickets, the next stop on your Adrià tour. This place is big on entertainment, as evidenced by the boogeyman hanging from the ceiling, the oversized petits-fours cart, or the approximately one thousand gold Japanese “lucky cat” statues waving from the bar, which has tomatoes hanging from it. 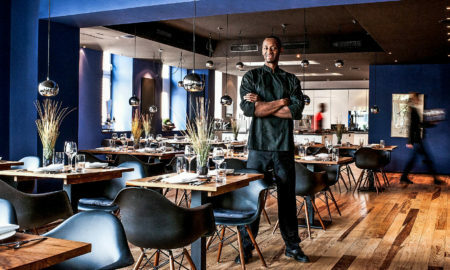 Behind the counter is Fran Agudo, the establishment’s head chef, who makes sure that dishes like “foie gras, corn, and licorice” or “tomaca with basil oil, puffed quinoa, and tomato-seed vinaigrette” don’t leave the kitchen any less than perfect. 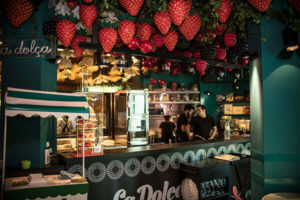 The room that held 41°’s eight-ton bar until 2013 now has giant strawberries hanging from the ceiling and dishes like “preserved figs with fig-leaf ice cream and freeze-dried figs” heading through the dessert pass. Albert Adrià did start his career as a pâtisser, so you’ll be hard-pressed to find “ordinary” desserts at any of his restaurants. No, indeed. This is where you come to discover that, in the hands of the right chef, soy-sauce ice cream can round a meal out wonderfully. 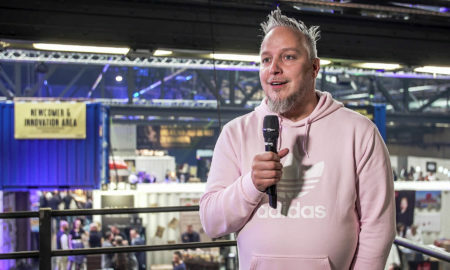 “We’ve perfected it,” Albert Adrià says, taking a bite of the ice cream during the interview. After all, just because the chef has a camera and a microphone pointed at him, it doesn’t mean that he can’t go about his day in BarriAdrià as usual. Adrià’s voice takes on a tender note, almost like he’s in love with the ice cream. Which he is, in a way — just as he’s in love with the culinary world in general, and everything that comes with it. It would be easy to forget something like that amid all the hustle and bustle of running six restaurants — along with several projects outside of Barcelona, such as the art-music-food project “Heart” on Ibiza or the Spanish food hall in the works in New York — but it’s still the motivation behind everything Albert Adrià does. Which means that, actually, he doesn’t have to care one way or the other about his last name, about the long shadow it casts. Sure, he was delighted to be named Pastry Chef of the Year on the 2015 San Pellegrino list, but it wasn’t necessarily a goal of his. His goal, he says, is to express himself through his culinary creations. And he does it fluently in many different languages. In Hoja Santa and the nearby Niño Viejo, he does it with authentic Mexican products and recipes: Paco Méndez dishes out creations like “soft almonds with avocado granizando Estado de Mexico” and “tequila cloud jalisco”. 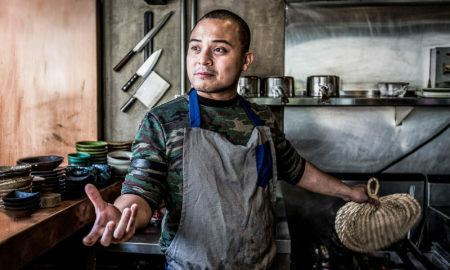 “I agreed to start a whole new life out here because I knew that Mexican food can be so much more than tacos and enchiladas, and here I have the freedom and the opportunity to prove it.” The Mexican bounces back and forth between Michelin-starred cuisine at Hoja Santa and Mexican bistro food (and luchador masks) at Niño Viejo. Everyone there follows his command, whether Albert Adrià’s around or not. In fact, that’s another thing you might not notice at first glance (unless you were watching “Constructing Albert,” an excellent documentary that premiered recently at the San Sebastián Film Festival). 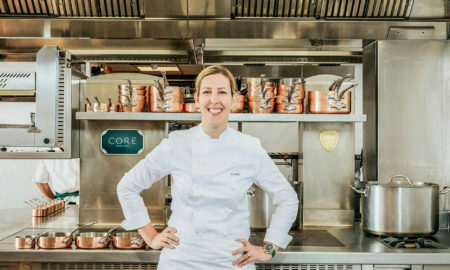 The chefs who work here do it for the same reasons that people like Grant Achatz and René Redzepi worked at elBulli: they want to make a difference, to test the boundaries, push their own limits. And Albert Adriá gives them their choice of five languages to do it in, from Nikkei to Mexican. They may be spread across six independent locations, but they’re one team, with one spirit. So if each restaurant has a language, what language is the mysterious Enigma, which has seating for 24 in a 7,500-square-foot space and has a rule against taking pictures of the food? 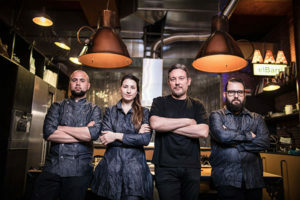 It seems like it’s a language unique to Adrià, developed over 34 years of culinary experience, with the collective creative power of the entire team. But Adrià stresses that Enigma isn’t his flagship concept— each one is different, he says, and they’re all equal. 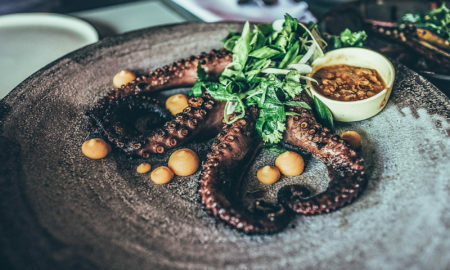 True, Enigma is the one seemingly held to the standard of becoming the best restaurant in the world, but why should the chef limit himself to just one outlet of creative expression? 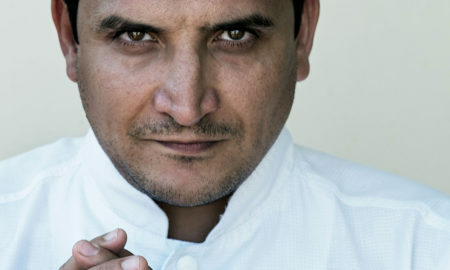 Oliver Peña, formerly the head chef at 41°, is working the pass at Enigma as well. The eight-ton bar is here, too. 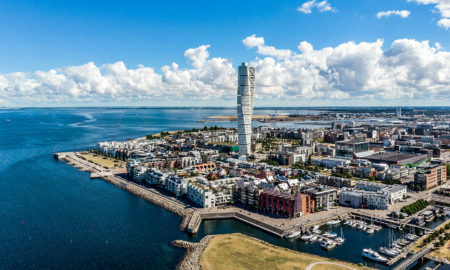 In fact, it’s the last stop on an Enigma guest’s journey — after “cherryboshi” in the detox room, “shiso with ugli fruit and passion fruit on ginger and kumquat” at the bar, and “sea cucumber with Iberian ham and pil-pil sauce” at the teppanyaki grill. There’s not just one dining room here, in case that wasn’t evident. 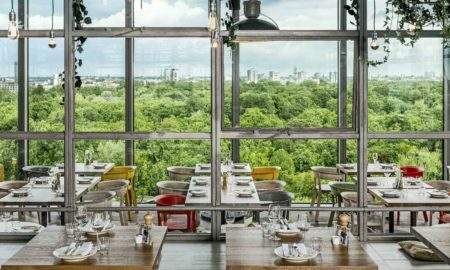 “The perfect restaurant — the one that creates memories, the one you never forget — is only 80 percent about food,” says Ferran Adrià. The rest is other things. 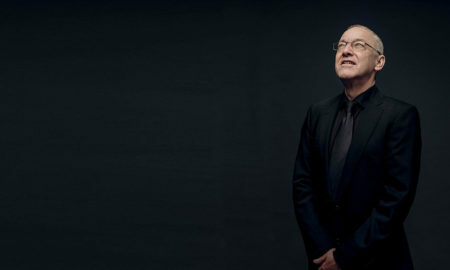 Albert’s done it through the location itself.” Though Albert is the only Adrià actually running BarriAdrià, the brothers have never stopped working together: sometimes as friends and brothers, sometimes as official partners (for example, for their homage to Spanish cuisine on New York’s Hudson River, which is expected to open in 2018). According to Jose Andrés, the third partner in the Hudson River project and (of course) another elBulli veteran, the question is this: “What would elBulli have been without Albert? But also, what would Albert have been without Ferran?” Fortunately, it’s not a question we actually have to answer. The gastronomic world, the whole world of creative thinking and reinterpretation, just wouldn’t be quite the same without either of them. The culinary world’s Mount Olympus has plenty of room for two Adrià. In just seven years, Albert Adrià has managed to enrich Barcelona’s culinary scene by not just a restaurant, but an entire restaurant district. His six locations range from Mexican (Hoja Santa, Niño Viejo) to Nikkei (Pakta), from traditional (Bodega 1900) to playful (Tickets) to the mysterious Enigma. All of them have a single mission: to forge new and creative culinary paths..